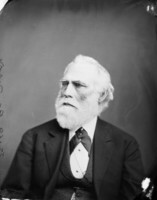 EDDY, EZRA BUTLER, businessman and politician; b. 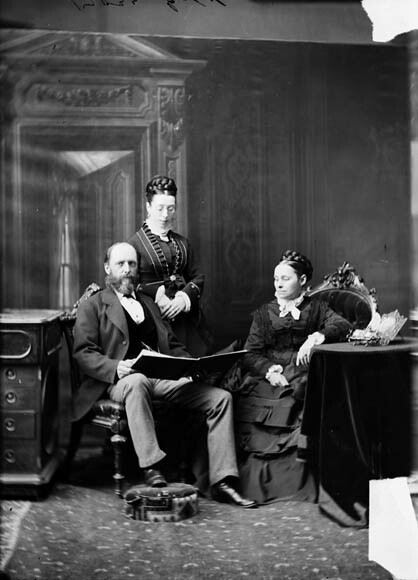 22 Aug. 1827 near Bristol, Vt, son of Samuel Eddy, a farmer, and Clarissa Eastman; m. first 29 Dec. 1846 Zaïda Diana Arnold in Bristol, and they had two sons and one daughter; m. secondly 27 June 1894 Jennie Grahl Hunter Shirreff in Halifax; they had no children; d. 10 Feb. 1906 in Hull, Que., and was buried on 13 February in Bristol. 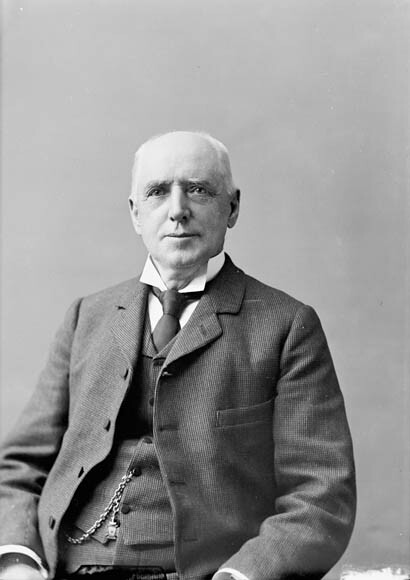 Ezra Butler Eddy’s career in business stands in marked contrast to that of a number of American families who were drawn to the Ottawa valley with the ratification of the Reciprocity Treaty of 1854 and later became part of the timber aristocracy. Unlike his compatriots who were already well-to-do at the time they arrived, Eddy is the epitome of the self-made man. He came with modest means but an ample supply of boldness, perseverance, and opportunism. A well-known figure, yet mysterious in many ways, he was to rise among the business élite of the valley in a climate of economic liberalism that favoured rapid successes, bankruptcies, and fresh starts. Little is known about Eddy’s life prior to his arrival in Hull Township about 1854. He is believed to have attended the public school in Bristol and to have begun his career in New York City as a store clerk. That his various ventures into the dairy produce business and the manufacture of matches in Vermont in the period 1847–54 were none too profitable may explain why he left for Hull. 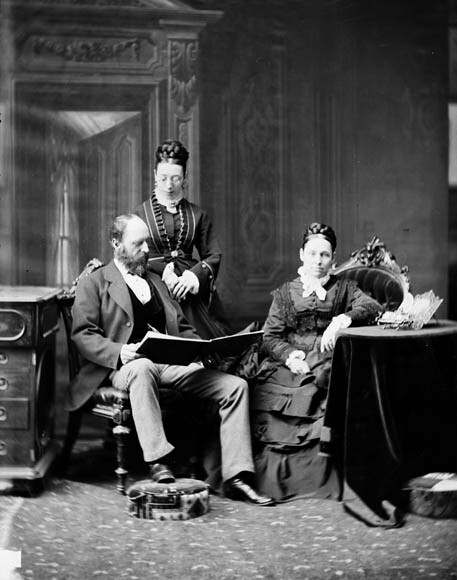 At this time there were business links between the Ottawa valley and Burlington, where Eddy is thought to have worked before leaving the state. Shortly after moving to Hull Township, Eddy began making sulphur matches by hand in a shed he rented from Ruggles Wright. The enterprise began as a family business, with Mrs Eddy teaching local women and children how to package the matches at home. They were sold in a store near the factory and distributed throughout the region by Eddy himself. According to his long-time associate George Henry Millen, he was a born salesman. His enterprise apparently met with some success, since from 1854 to 1862 the products he shipped by boat, via the Rideau Canal, diversified to include wooden buckets, washboards, and clothes-pins. Unlike the other valley magnates, Eddy entered the lumber business as a manufacturer of wood products. Taking advantage of the difficulties being experienced by Philemon Wright*’s descendants in adapting to new business conditions, Eddy bought land from them – an indication that his operations were flourishing. Between 13 Oct. 1866 and 3 May 1872 he purchased several lots in wards 2, 3, and 4 of the village of Hull, including the whole of Philemon Island, which was particularly well located near the Chaudière Falls. His first venture into the lumber business dates from this period, when he rented a sawmill from the Wrights. Eddy’s investments in the sector, at a time when there was a heavy demand for wood of all kinds, seem to have been profitable. By the beginning of the 1870s he had accumulated enough capital to purchase timber limits and build his own sawmill near the match factory. From then on his rise was spectacular. Between 1870 and 1880 his annual output of lumber varied from 50 to 75 million board feet, and he acquired three more sawmills. Thus he was one of the largest producers in the Ottawa valley. From every point of view the 1870s were crucial years in Eddy’s career. The purchase of timber limits at public auction, facilitated by legislation then in effect, turned out to be a windfall for him. The growth of his enterprises and his access to a certain amount of capital borrowed from “his friends in Ottawa” enabled him to take advantage of a favourable situation. In 1873, at the outset of the international depression brought on by the collapse of the American and British markets, Eddy held cutting licences on more than 1,412 square miles of limits along the Dumoine, Coulonge, Gatineau, Du Lièvre, and Ottawa rivers. He also owned at least one farm, in the village of Fort Eddy, which supplied his shanties. It is difficult to determine the extent to which his career in provincial politics helped him acquire his timber limits. It did, however, coincide with the period during which his holdings grew. 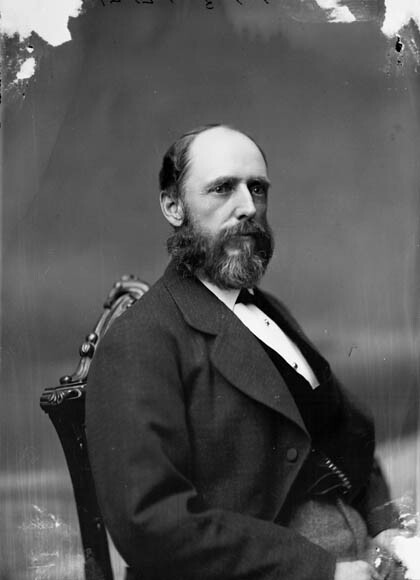 Already well known in Hull Township as the chief employer of local labour, Eddy ran as a candidate in 1871 to succeed Levi Ruggles Church*, the Conservative member for Ottawa riding in the Quebec Legislative Assembly since 1867. He was elected for the ruling Conservatives with a majority of 777 over his Liberal opponent, Charles Leduc, but his political career would be short. Running as an independent in 1875, he lost his seat to Conservative Louis (Roch) Duhamel. Unrest engendered by the incorporation of Hull as a municipality, the political situation in the province, and demographic changes in the constituency, which now had a French-speaking majority, all contributed to his defeat. True to his tradition as an individualist in business matters, Eddy seems to have been anything but doctrinaire. “Caring very little for political theory,” to use his own words, he had concerns of a practical nature related to his own interests and those of his riding. For four years he had served as both mayor of Hull Township and mla. In the Legislative Assembly Eddy played a minor role, supporting the governments of Pierre-Joseph-Olivier Chauveau* (1867–73) and Charles-Eugène Boucher* de Boucherville (1874–78). 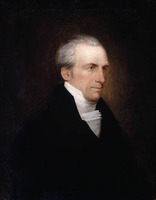 Often absent because of the demands of business, he attended mainly as mayor of Hull Township, committed to the local interests of the inhabitants of the lower township, who wanted to be incorporated as a municipality separate from the township. 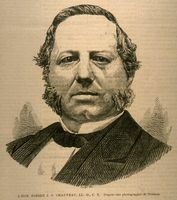 He introduced the bill creating the city of Hull in 1875. At a time when entrepreneurs from the Ottawa valley needed access to their timber limits, he took up the cause of opening the province to capitalists by his defence of the bill to incorporate the Ottawa and Gatineau Valley Railway Company. 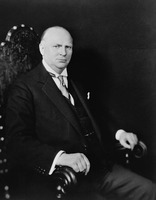 It was in this period that he served as a director of the Central Canada Railway. By the beginning of the 1880s, Eddy was well and truly one of the business élite in the valley, although he did not yet have the status of such old families as the Wrights. But it was mainly as a far-sighted and canny industrialist that Eddy would leave his mark. The depression that affected the timber business in the period 1873–80 forced him temporarily to hand over control of his enterprise to the Merchants’ Bank of Canada. In 1882, just when things seemed to have returned to normal, his plant was all but completely destroyed by a major fire. Though almost bankrupt, with a loan from the Bank of Montreal he rebuilt an industrial complex consisting of two sawmills, a door and window factory, a planing mill, a match factory, foundries, offices, and warehouses. To obtain the loan, Eddy had to allow the bank’s manager, William Horsley Rowley, to supervise his financial affairs. Following the fire, Eddy decided to divest himself of some remote and costly timber limits and to retain only enough to supply his factories. 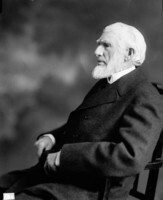 In 1886 he consolidated his enterprises and incorporated E. B. Eddy Manufacturing Company as a joint-stock company, of which he was president and which had a funded capital of an estimated $300,000; among his partners were Rowley, Sturgis Salmon Cushman, Richard Reid Dobell, and Thomas Beckett. Eddy began to take an interest in wood pulp. He bought the production rights for indurated fibreware, which his firm would begin turning out in 1887. In 1888, one year after Charles Riordon*, who is considered the first in Canada to make chemical pulp using the Mitscherlich process, Eddy began constructing a bisulphite pulp factory. It was equipped with four digesters and went into operation in December 1889. Always on the lookout for technical advances, Eddy helped make the process much more efficient by building a digester in the form of a tower. The bulk of his pulp was shipped to the United States. His firm’s rapid progress from the production of pulp to the manufacture of paper demonstrates Eddy’s entrepreneurial spirit and business acumen. He installed his first paper-making machine in 1890 and added two others in 1891. Between 1889 and 1894 he and his partners set up a paper factory equipped with five machines for making tissue paper, printing paper, brown paper, and, from 1896, newsprint. Eddy had reacted to the downturn in the lumber trade early in the 1880s by moving into the growth sector of pulp and then paper manufacturing. Having apparently controlled the Canadian match market from 1879, the “match king” continued to expand that factory also. The growth of the Eddy industries required additional land, as well as control over the water-power needed to operate the new plants. Between 1888 and 1894 the company again increased its landholdings, mainly by purchasing lots along the Ottawa River and Chaudière Falls, from the Wright family, the city of Hull, and the Quebec government. Although Eddy occasionally speculated in land, he apparently did so mainly to consolidate his enterprises. Indeed, as a rule he was not even the owner of his workers’ houses. By the late 1890s he held a predominant place in the Canadian paper industry. Along with Eddy’s rise in the business world, his political power grew and he became more established in the local élite. Frequently elected alderman in the municipality he had helped create, he represented Ward 3 from 1878 to 1888 and again in 1891–92. He served as mayor of Hull from 1881 to 1884, in 1887, and in 1891. Eddy was intimately involved in municipal life, and, not surprisingly, the expansion of his business operations and the growth of the city were inextricably linked. His experience on the provincial scene, crucial role in the manufacturing economy of Hull, and defence of his own interests, all made him an obvious choice for various committees responsible for conferring with the provincial government or with directors of toll-gate companies. Sometimes as an alderman Eddy merged his political and financial interests, offering to pay the interest on city debentures or transferring promissory notes to the municipality. Thus a number of improvements to the waterworks and electrical system of Hull came as a result of needs shared by the Eddy companies and the citizens. Having been raised a Baptist, Eddy was active in many philanthropic causes in the Ottawa valley community. He was non-sectarian in outlook and financed Protestant institutions regardless of denomination. Although his generosity was also occasionally directed towards Catholic institutions in and around Hull, the main beneficiary was the Protestant community on the Ontario side of the river; he contributed to the Ottawa Ladies’ College, the Orphans’ Home of the City of Ottawa, the County of Carleton General Protestant Hospital, and the Annie Lewis Memorial Convalescent Home for Sick Children of Ottawa. He was an influential freemason, and a lodge bearing his name was founded in the 1870s. Along with John Rudolphus Booth*, Eddy was one of the few businessmen on the Chaudière Falls to recover from the great fire of 26 April 1900, which destroyed much of the industrial part of Hull and Ottawa. His losses were estimated at $3,000,000, of which only $150,000 is thought to have been covered by insurance. Rebuilt in less than a year, the Eddy factories were in operation again by December. By 1902 the company had resumed all its activities and was providing employment to more than 2,000 people in the sawmills and the factories making paper, indurated fibreware, matches, paper bags, buckets, and tubs. The seven paper machines were turning out 80 tons of paper a day. Eddy had thus diversified his enterprise and completed the move from lumber to paper in quite a short span. Eddy died in Hull on 10 Feb. 1906 at the age of 78. An imposing figure, he evidently continued going to his office until he was well on in years. In so doing, he fostered the almost mythical image he had always projected among his fellow citizens, that of an energetic, hard-working man of action. Contemporaries extolled his astute business sense, his determination, and his efficiency as an administrator. At a period when relations between employers and employees were thoroughly paternalistic, Eddy the capitalist was perceived as both a benefactor of the Ottawa valley community and an uncompromising but respected employer. Penniless on his arrival from his native Vermont about 1854, he left a fortune estimated at the time to be more than $2,500,000. Despite financial obstacles and devastating fires his operations reportedly had grown steadily. Among the industrialists of his day he came to be recognized as a progressive innovator, one of the first to use electricity in his factories (1883), to use the bisulphite process (1889), and to begin transporting goods by truck (1905). By the terms of his will, Eddy would continue to exercise a kind of control over the company. It directed that the chief beneficiaries, his partners, were to carry on his work for ten years. At the end of that time, the shares would be redistributed in favour of Eddy’s second wife, who had to give up her claim to the joint estate in order to gain title to them. The Eddy enterprise began as a family business, but by 1916 it no longer was one. 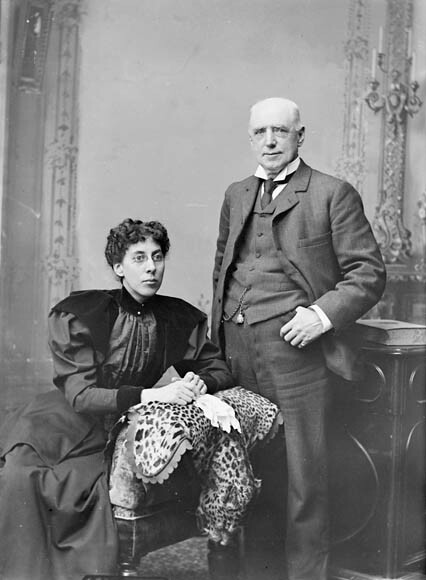 Eddy’s direct descendants, his only daughter Ella Clarissa and his grandson Ezra Butler Eddy Bessey (who changed his name to Ezra Butler Eddy in 1912), were almost left out of the estate. 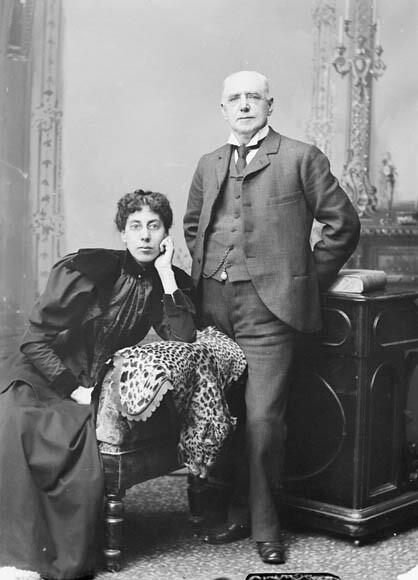 In 1896, in a famous case that set a legal precedent, Eddy and his daughter had gone to court over the inheritance left to her by his first wife in 1893. Control of the company, as well as goods and property of some value, came into the hands of the second Mrs Eddy, and on her death in 1921 went to her brother Joseph Thompson Shirreff. Shirreff died in 1926 and by his will Richard Bedford Bennett, a friend and legal representative of the Shirreff family, became the principal shareholder of the E. B. Eddy Company. From the outset Eddy took great pains to accumulate the capital needed to expand his manufacturing operations. He did not hesitate to enlarge his factories and to venture into promising fields at the opportune moment. With the sums acquired from his manufacture of wood products, he went into the lumber trade around 1870. Then, in 1886, he made a sudden switch to pulp and paper, his success in the timber trade enabling him to move from matches to paper. Although before his company was incorporated in 1886 he seems to have been in business on his own, it is difficult to make a categorical statement. During his lifetime and for a decade after his death, Eddy continued to be, as he himself wished, the chief overseer of the company that still bears his name. ANQ-O, CN1-18, 8 févr. 1888, 17 juill. 1890, 4 févr. 1897, 23 févr. 1906; P-137. Arch. de la Ville de Hull, Qué., Procès-verbaux du conseil de la cité de Hull, 1875–94. NA, MG 24, D8; MG 26, K: 580176; RG 31, C1, 1851, 1861, Hull Township; 1891, Town of Hull, dist.2. National Capital Commission (Ottawa), Chaudière docs., 5, 18, 20. “E. B. Eddy, magnat de l’industrie du bois à Hull,” Le Droit (Ottawa), 8 janv. 1972. “Intéressant historique de la Co. E. B. Eddy,” Price Current (Montreal), 16 Feb. 1923: 16–23. Ottawa Citizen, 14 Aug., 4 Sept., 4, 31 Oct. 1872; 12–13 Feb. 1906. Edgar Boutet, Le bon vieux temps à Hull: notes historiques sur l’Outaouais . . . (3v., Hull, 1971–75), 1: 141–43; 3: 5–31. George Carruthers, Paper-making (Toronto, 1947), 389–406. [R.] P. Gillis, “Ottawa and Hull, 1870–1930: a description and analysis of their industrial structure,” Ottawa-Hull, spatial perspectives and planning, ed. Rolf Wesche and Marianne Kugler-Gagnon (Ottawa, 1978), 13–20. “One hundred years young: the E. B. Eddy Co.,” Pulp and Paper Magazine of Canada (Gardenvale, Que. ), 52 (1951): 69–73. Qué., Assemblée Législative, Débats, 1871–75. Léo Rossignol, “Histoire documentaire de Hull, 1792–1900” (thèse de phd, univ. d’Ottawa, 1941), 208–12. Joseph Tassé, La vallée de l’Outaouais: sa condition géographique, ses ressources agricoles et industrielles, ses exploitations forestières, ses richesses minérales, ses avantages pour la colonisation et l’immigration, ses canaux et ses chemins de fer (Montréal, 1873). Odette Vincent-Domey, “EDDY, EZRA BUTLER,” in Dictionary of Canadian Biography, vol. 13, University of Toronto/Université Laval, 2003–, accessed April 25, 2019, http://www.biographi.ca/en/bio/eddy_ezra_butler_13E.html.